Videofilm: An experimental Video Film by Nancy Mroczek PhD. A gut wrenching and provocative avant garde representation of the sorrowful course and meaning of Vietnam. A montaging of military archival photos, actual video footage, and Boston location video enactments to portray a metaphysics and legacy of damage to history and to now. Original music soundtrack by Architectural Metaphor. Dr Mroczek talks with Vietnam veterans who tell how they feel now and what their experience was in Vietnam and since that time. 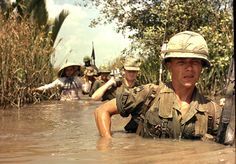 They describe being young, naïve, believers in stepping up to do what a person should for country, being totally unprepared for what they would face, having no way to escape their circumstance once in Vietnam, admiring the Vietcong for their determination to save their country, and becoming hardened by death and the ever present threat of it all around. They talk about what it is like to kill, how they developed personal strategies to increase the probability of coming back alive, how they came to believe in the central role of corporate money in what was occurring. They describe what it is like to have PTSD. They also describe their great shock and dismay to come back to a country that they experienced as hating them, their painful “isolation” and aloneness once home in dealing with ostracism (and it being the ‘reward’ for their service), and the never ending harrowing condition of PTSD which continues unabated for them. They say the Veteran’s Administration has been unconcerned and ineffectual, and that the government just wanted them to effectively go away, disappear, once they returned to the USA.